The Atami Marine Fireworks Festival is held through the four seasons. Atami Bay is surrounded by mountains on three sides so the sounds of the fireworks reverberate magnificiently. It has sound effects like that of a big stadium and visitors can see the stunning and dynamic fireworks display. The Sky Niagara adorning the finale is launched from the whole site. Silver-colored fireworks abound in the night sky of Atami. 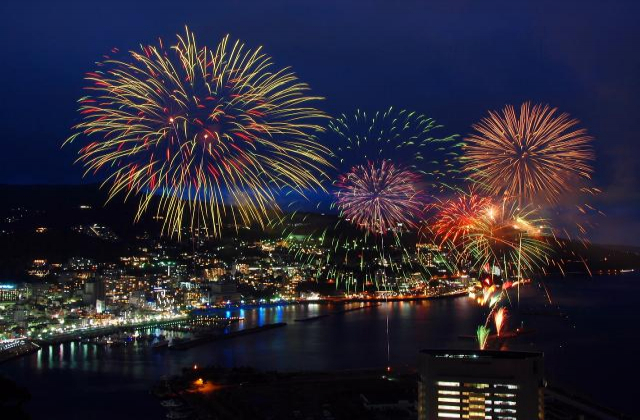 Visitors can enjoy viewing and experiencing the beauriful fireworks at Atami.